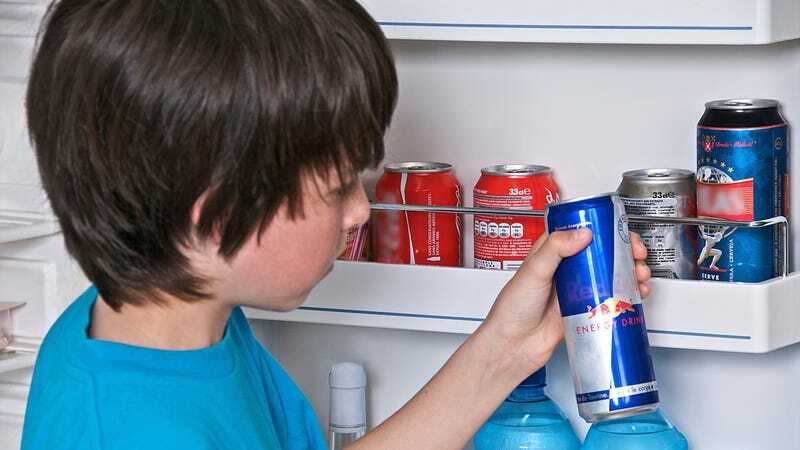 A 2011 report from the American Academy Of Pediatrics concluded that “energy drinks pose potential health risks because of the stimulants they contain, and should never be consumed by children and adolescents.” Yet, the caffeinated, sugary drinks can still be sold to children in the U.S.
Last year, a teenager died after chugging a latte, a Mountain Dew, and an energy drink, leading to a deadly “caffeine-induced cardiac event,” according to the Post. In 2015, a 19-year-old died after drinking more than three 24-ounce cans of Monster Energy in a 24-hour period, leading his father to sue the company, according to TMZ. Fortunately, the U.K. is having better luck installing an age limit for these products. The latest effort was in reaction to the recent death of 25-year-old Justin Bartholomew. According to the BBC, his parents are convinced that his habit of two dozen energy drinks a day contributed to his suicide. While Prime Minister Theresa May “said the government had taken action over high-sugar drinks and would continue to look at the evidence,” several retailers are going ahead with their own bans. The Nottingham Post reports that grocery chains Aldi and Asda are following the example of retailer Waitrose by banning the sale of high-caffeine energy drinks to anyone under 16. Anyone purchasing those drinks will have to show proof of age. And the sale of energy drinks containing caffeine or stimulants to anyone under 18 has already banned outright in countries like Latvia and Lithuania. U.S. legislators and retailers, take note.